al Aqsa was built by abd ul-Malik ibn-i Marwan in 695 CE. The mosque was originally a small prayer house built by the Rashidun caliph Umar, but was rebuilt and expanded by the Umayyad caliph Abd al-Malik and finished by his son al-Walid in 705 CE. It is mentioned in Quran in the following verse "Glory be to Him Who made His servant to go on a night from the Sacred Mosque to the remote mosque of which We have blessed the precincts, so that We may show to him some of Our signs; surely He is the Hearing, the Seeing". North-east exposure of Al-Aqsa Mosque on the Temple Mount, in the Old City of Jerusalem. Considered to be the third holiest site in Islam after Mecca and Medina. The small studs to the left are remains of Corinthian Columns. The lead dome of the mosque is also partially visible. Renovations, repairs and additions were undertaken in the later centuries by the Ayyubids, Mamluks, Ottomans, the Supreme Muslim Council, and Jordan. The mosque along the southern wall of Haram al-Sharif, with lead-sheeted Dome of al-Aqsa at the top and al-Fakhariyya Minaret to the left is also visible partially. The ruins to the right background are those of a seventh century Umayyad Palace. To the left (western) side the arch of Robinson is also visible in the Herodion Street. The facade consists of fourteen stone arches, most of which are of a Romanesque style. The outer arches added by the Mamluks follow the same general design. The entrance to the mosque is through the facade's central arch. The facade of the mosque was built in 1065 CE on the instructions of the Fatimid caliph al-Mustansir Billah. It was crowned with a balustrade consisting of arcades and small columns. The Crusaders damaged the facade, but it was restored and renovated by the Ayyubids. The porch of al-Aqsa is located at the top of the facade. The central bays of the porch were built by the Knights Templar during the First Crusade, but Saladin's nephew al-Mu'azzam Isa ordered the construction of the porch itself in 1217. The central main entrance to the prayer hall is third on the right. Interior of the main prayer hall, with minbar and mehrab in the far background, looking towards the qiblah wall (southern wall). The al-Aqsa Mosque has seven aisles of hypostyle naves with several additional small halls to the west and east of the southern section of the building. The mosque's interior is supported by 45 columns. Unlike the Dome of Rock the style of the al-Aqsa or al-Qibli masjid is representative of early Islamic Architecture. al-Ghawanima Minaret is one of the four minarets of al-Aqsa, is situated on the north-western corner of the complex. The golden Dome of Rock is to the left, the black dome of al-Aqsa (left) and the Bab al-Silsilah minaret (right) are also visible in the far background. The minaret is almost completely made of stone except the wooden canopy over Muazzin's balcony. Because of its firm structure, the Ghawanima minaret has been nearly untouched by earthquakes. Located in the south-eastern corner of the al-Aqsa, the facade of the Masjid al-Qibli, although believed to be situated on the site marked by the second caliph, it may not be an exact location. The axis of the mosque is uncertain, and traditional location of the current structure dates back to the thirteenth century. 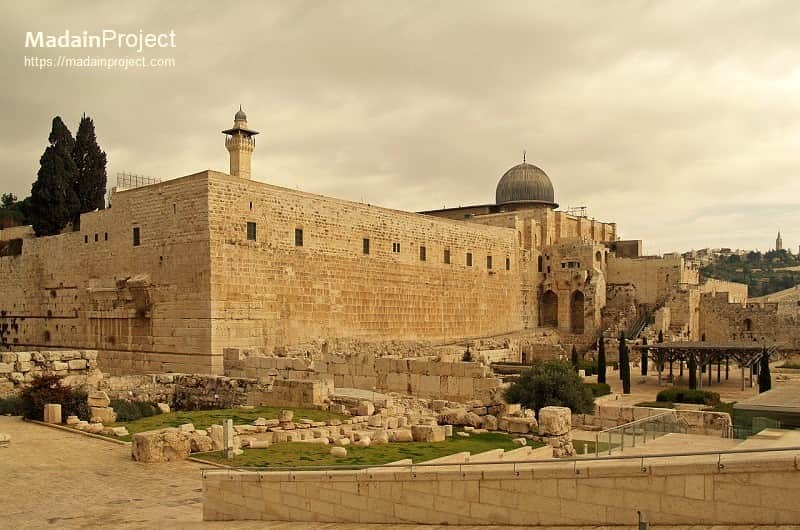 The central axis of the main al-Aqsa mosque has shifted several times during the centuries. Entrance to the basement of al-Aqsa, now most commonly known al-Aqsa al-Qadeem, was originally an underground arched access tunnel leading from the western Hulda Gates in the southern wall, up to the Temple Mount Platform. Each arch of the double gate led into an aisle of a passageway leading from the gate into the Mount, and to steps leading to the Mount's surface; when the al-Aqsa Mosque was built, the old steps were blocked, and the eastern aisle lengthened so that new steps from its end would exit (pictured here) north of the Mosque.